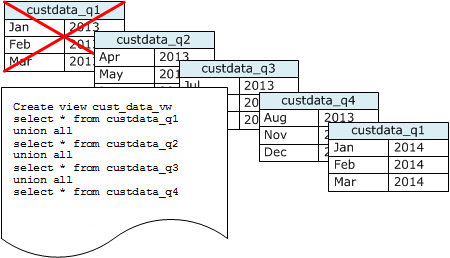 If you maintain data for a rolling time period, use a series of tables, as the following diagram illustrates. You avoid the added cost of deleting rows, because a DROP TABLE operation is much more efficient than a mass DELETE. If the tables are sorted by timestamp, no vacuum is needed. If each table contains data for one month, a vacuum will at most have to rewrite one month’s worth of data, even if the tables are not sorted by timestamp. You can create a UNION ALL view for use by reporting queries that hides the fact that the data is stored in multiple tables. If a query filters on the sort key, the query planner can efficiently skip all the tables that aren't used. A UNION ALL can be less efficient for other types of queries, so you should evaluate query performance in the context of all queries that use the tables.